1:1 Concentrate doubles the volume. 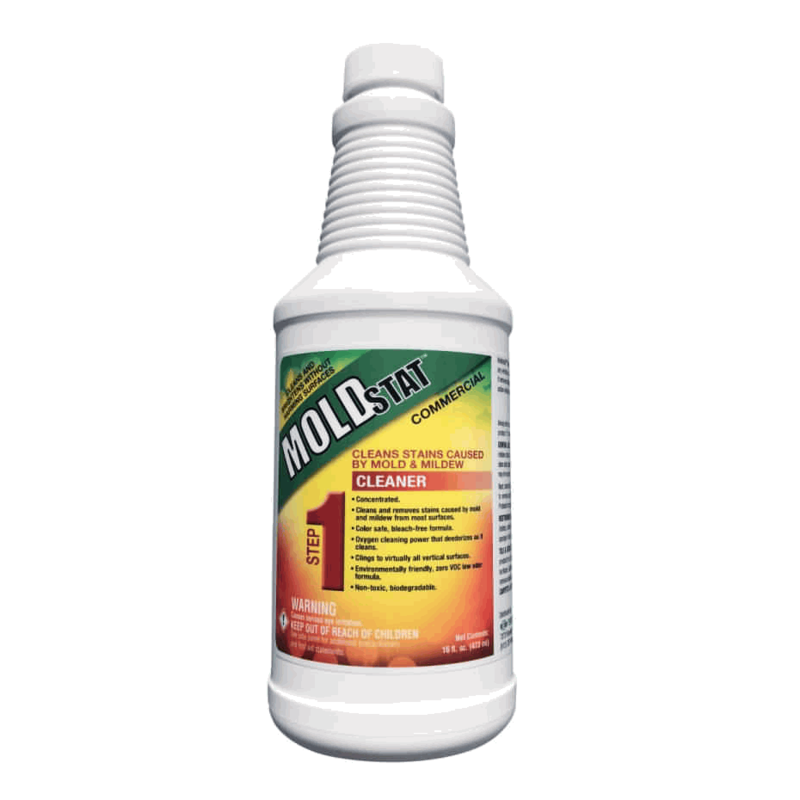 MoldSTAT Commercial #1 is a concentrated PerOxy Cling mold cleaner specially designed to cling to mold stains on vertical surfaces while addressing the environmental, safety and health concerns facing today’s housekeeper and facility maintenance professional. 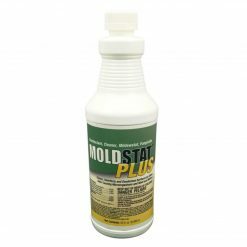 Clinging to surfaces longer improves mold removal results. Mold Cleaner PerOxy Kling concentrate contains no acids, amonia, phosphates! Step #1 Mold Cleaner – PerOxy Kling is a powerful Mold Cleaner without silicones, chelating agents or dyes. 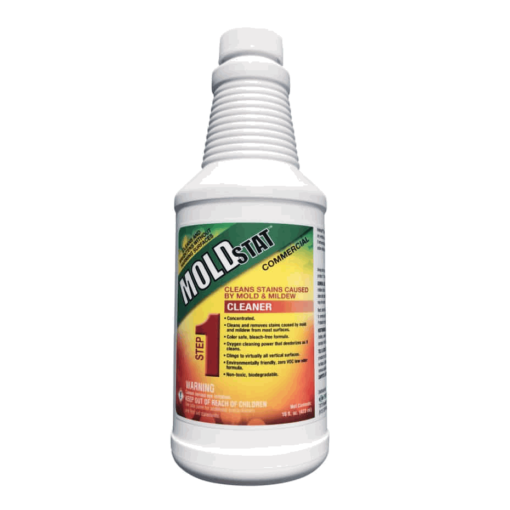 Oxygen powered MoldSTAT PerOxy Kling Cleaner for mold stain removal on walls, floors, tile and grout, carpets, stainless steel, chrome, porcelain, concrete. Exterior housing surfaces and roofs are safe for Oxygen Mold Cleaner PerOxy Kling. Mix 1:1 with water and spray on surface; agitate with cloth or brush if needed. Mix 1:1 with water and spray on stain and rub in gently. Mix 1:1 with water and spray on surface of tile and/or grout. Mix 1:1 with water and spray directly on mold and mildew. For porcelain, fiberglass and stainless steel associated with restroom fixtures (urinals, sinks, tubs, etc.) Mix 1:1 with water and apply directly on surface and rub with sponge or cloth. Saturate stained area, rub into fabric and let stand for 5-10 minutes, then wash as usual. SUCH AS: Concrete, floors, roofs, fences, decks or exterior building walls, one apply with a pump-sprayer or bucket and mop using a 1:1 dilution ratio with water. Concentrate mixes 1:1 with water to double the cleaning coverage. My boyfriend and I bought a foreclosed home with a serious black mold problem in the crawls space and basement. The mold was caused by a flooding related sump pump failure. Instead of spending thousands of dollars to have someone else clean it, we found your mold removal products and advice on Cleaner Today’s website and decided to do it ourselves. We applied the PeroxyKling three times to the entire basement (both foundation and concrete cinder block), and then we used your Fogmaster Jr. to apply the MoldStat Plus (three times, to be sure). There was more than enough product for the applications, and now that we have cleaned and fogged the entire house, the odor and mold is gone, and we can move in safely (Air tests we showing 22,000 spores per square meter *before* the MoldStat, and we plan to have the air tested again to keep on record that we have remediated the mold). I have severe allergies, and go into anaphylaxis from mold. 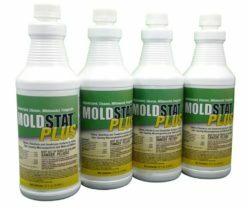 The fact that I can breathe easily and have no reaction is proof alone that moldstat plus worked! 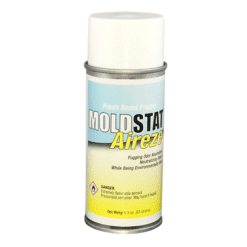 We can’t thank you enough, and now recommend your product to anyone who has a mold problem. 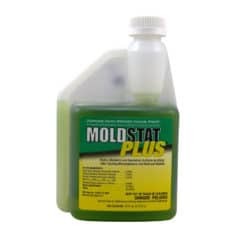 Mold Killer MoldSTAT Plus – 1 Gal.